I grew up a diehard baseball fan (from the time I could walk, really), and there is definitely a “dream list” of places I knew I HAD to visit at least once, or else my hardball life just wasn’t going to be complete: Yankee Stadium, Fenway Park, Cooperstown, and so on. I’m ecstatic to say, I just got to check one of those places off my list two weekends ago when I caught a game in the “Friendly Confines” of Wrigley Field! 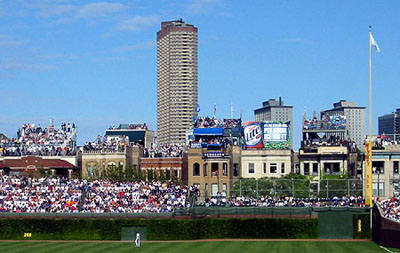 So what is it about Wrigley that makes every true baseball fan want to go visit? All I can say is that it definitely has a magic and flair all of its own (very similar to the city of Chicago itself for that matter). I grew up and have spent my whole life out west and am a huge Dodger fan from birth, but I have no regrets saying that taking a game in at Wrigley Field to “root, root, root for the Cuuuubbbbiesssss” is something that is tough to beat. That last statement takes nothing away from my love for the Dodgers by the way. I can’t tell you how exciting it was to see my Blue Crew beat the Cubs down in last year’s playoffs. I even got to watch us clinch the series in Game 3 at beautiful Dodger Stadium (one of the single most exciting sports events of my life). And I pray for our chance to face the “Lovable Losers” again in this year’s playoffs; come on now, who wouldn’t? The odds are on your side! But regardless of performance, nothing can change the fact that the Wrigley Experience is a tradition like no other . . . The place is magical and so was my trip there. We arrived at the famous Addison train stop via the Red Line around 10:45 AM. With game time being the Wrigley-standard 1:20 PM, we had plenty of time to see the “sights” around the park (a.k.a. Wrigleyville). I was amazed! It wasn’t even 11 in the morning on a work day (Friday) and the streets were lined with people, the bars were packed, and fervor was in the air. I took it all in, and couldn’t help but say to myself, “This is my kind of place!” You couldn’t get this much pandemonium for a playoff game in our local Petco Park (I know it doesn’t happen often), much less for a weekday afternoon game against the lowly Pirates (as I wrote that last line, all of the Padre fans, and sole Pirates fan at work shot death-stares my way). After spending some time in many of the fine Wrigleyville establishments (and by the way there are more than you can count), we made it to the front of the stadium, which was packed with people trying to snap a picture of themselves in front of the famous Wrigley Field sign (myself included). There was even a self-proclaimed “Photo Guy” there, who works for tips by lying down on the concrete and taking people’s pictures in front of the sign, because “that is the best angle” (according to him). Whatever he is doing, he’s making a killing and I (briefly) contemplated a career change. 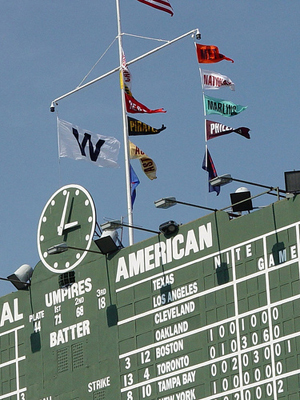 I’m pretty sure the flag was already raised and murmurs of “Go, Cubs, Go” could be heard around the park half way through the game, as I got to be the lucky spectator of the 17-2 shellacking the Northsiders put on the Bucs that day. Never mind that they plated four in the opening frame, they took it to another level in the 2nd and put up a 10-spot! With all those runs, I was waiting for them to ask me to step out of the stands and join the merry-go-round on the base-paths. Unfortunately, my invitation never came. It still was a sight to see though. 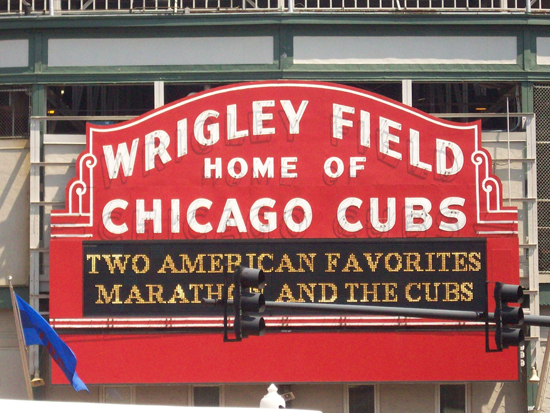 The last time the Cubs scored 14 in the first two innings, it was 1906 and Wrigley Field didn’t even exist. So getting to take part in history is always a memorable experience. Speaking of history for a second…Derek Lee had seven RBI’s through only four innings, only to have Sweet Lou pull him from the ballgame! I understand that the manager’s number one concern has to be about protecting a player from injury, and yada, yada, yada, but come on Lou! We were more than halfway to seeing a historic performance (the current most RBI’s in a game is 12) and you gotta do this to us?! I never saw the anticipation balloon pop quicker among Cubs fans since . . . well . . . since last year’s playoff sweep (sorry Cubs fans, I had to do it). Here’s where I make it up to you though . . . Even though the blowout was in full effect by the end of the 2nd, the Cubbie faithful were there to the end, cheering, screaming, and taking part in America’s pastime. You can’t say that about most fan bases in a rout of such drastic proportions. But that is exactly what makes this place so unique: it’s built on tradition and has a charm all of its own. It is everything a baseball stadium should be; nothing more, nothing less. And watching a ballgame there is an experience I will truly cherish forever. My “dream list” just got a little shorter. Thanks Wrigley! 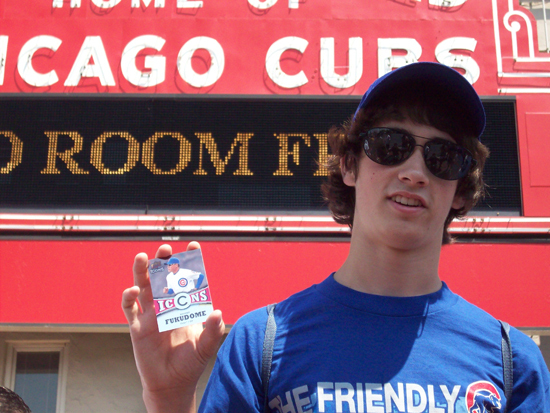 I wouldn’t be a true Upper Deck employee if I didn’t bring some packs to the people on my trip to Wrigley. Check out some pictures of the lucky recipients. 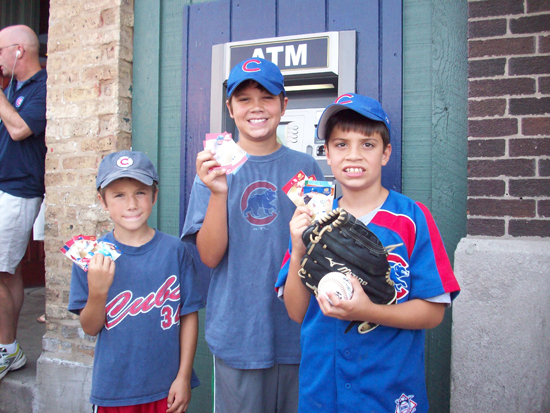 Three young Cubs fans get their hands on some Upper Deck cards. 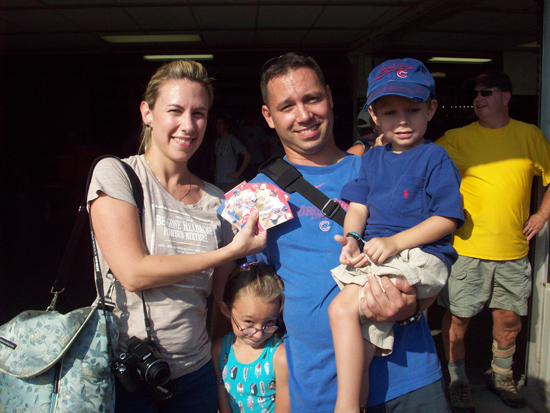 Opening Upper Deck packs at Wrigley is a true family experience. The Wrigley Done Right rooftop crew love what they find in their pack of UD Icons. 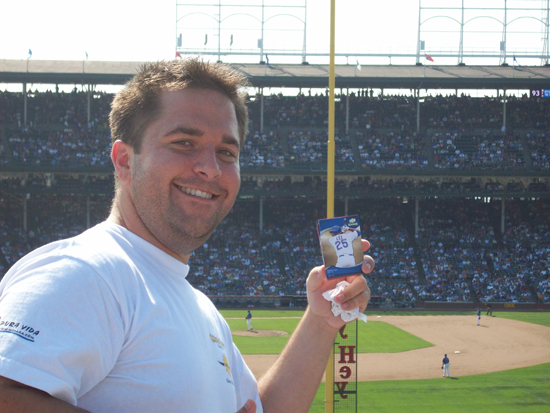 Opening a pack of Upper Deck baseball cards on the Wrigley field rooftops…priceless. 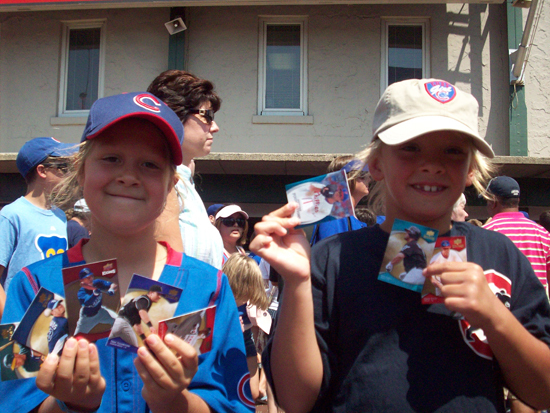 Derek Lee cards always seem to make the Cubbie faithful happy. 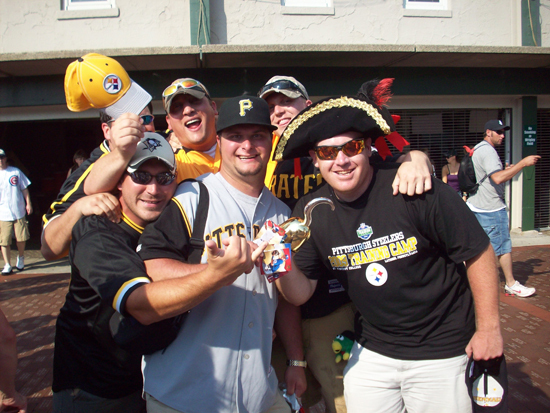 Even the Pirates fans joined in on the fun. Cubs fan pulls his favorite player, Kosuke Fukudome! Two young ladies enjoyed their packs of Upper Deck cards. Big winner on the right with a Cole Hamels jersey card! Nice story, Good to see the Cardinals flag on top. Enjoy baseball on TV in September Cubs fans! Great story, who ever wrote it did such a great job, I felt like I was there! Nice to see those Pittsburgh fans too! Great article, you not only made me laugh, but made me feel like I was there. Although baseball isn’t number one for me I am a die hard hockey fan I can still relate to the article. With every sport nothing is better than to see it live, with the smells, the people, and tradition. I can’t believe there was so many fans there on a Wednesday afternoon. That in itself is wonderful and shows love of the game. You captured the moments wonderfully, thanks for sharing your experience with us! Absolutely awesome article. I love the pictures of the Cubby fans rooting and supporting there team. Hey, when are you doing one on the new Yankee Stadium? Sorry, but I am a big time Yankees fan who lives on the west coast. 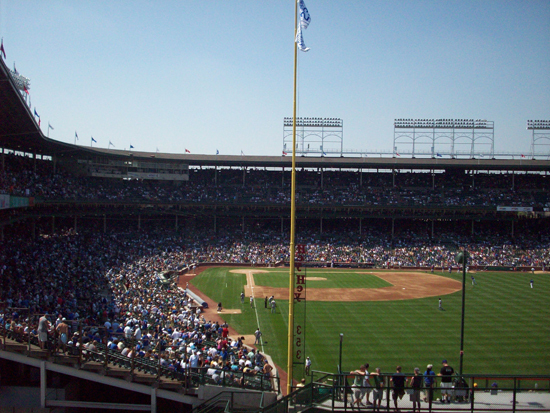 I have been eager though to go to Wrigley Field because I heard it is awesom with all the rich history they have. Once again phenomenal article.